Emiliano Zapata played a leading role in the civil wars that raged in Mexico between 1910 and his death in 1919. Born in San Miguel on 8 August 1879 (some sources say 1883), he began his revolutionary activities aged only 18 when he led a peasant’s revolt against the owners of the hacienda where he had been raised. He was taken into custody and, not long after his release, joined the army. On 18 November 1910 the Mexican Revolution began. In March 1911 Zapata joined the forces of Francisco Indalecio Madero in his battle against the dictatorial government of Porfirio Diaz but quickly came to the conclusion that Madero’s revolutionary reforms were too timid and, when he came to power in October 1911, Zapata refused to support him. Zapata had impressed many with his call to arms, “Es mejor morir de pie que vivir de rodillas!” (“Better to die on your feet than live on your knees!”). When Zapata’s men defeated the cruel and often drunk General Victoriano Huerta, he told the moderate revolutionaries that he would continue his own rebellion and Pancho Villa (search the article) joined him. The army of Zapata was responsible for a number of atrocities but they were as nothing compared to the horrors perpetrated by both sides during the wars in which almost one million Mexicans lost their lives. When Zapata’s men occupied Mexico City in 1914 they did not pillage but “asked humbly for a little food, or approached passers-by to beg a peso”. The revolutionary forces of Venustiano Carranza weakened Zapata and when Carranza became president in April 1915 he determined to wipe out all opposition. After an attempt to eliminate Zapata by force failed, he used subterfuge and General Jesus Guajardo, a Yaqi Indian, pretended that he and his men wanted to join Zapata. Zapata agreed to meet Guajardo at the Hacienda de San Juan on 10 April 1919 to plot further action. Zapata arrived with 150 men but only ten went inside with him, the rest remaining outside to protect against attacks from government troops. Inside the building Guajardo’s men formed a guard of honour and then a bugle sounded. On the third call the guard of honour turned their guns on Zapata and shot him dead along with his ten men. 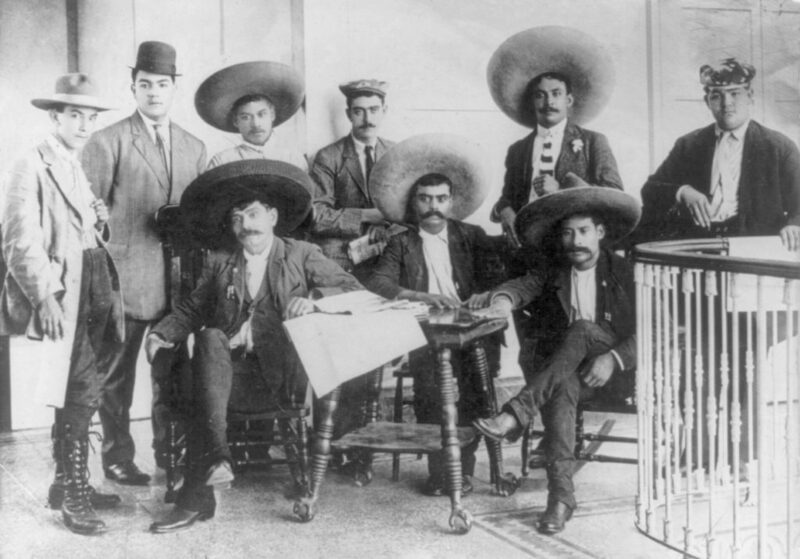 Zapata’s men waiting outside fled. For his treachery Guajardo was paid $10,000 and promoted to general. On 18 May 1920 Venustiano Carranza was assassinated. The Mexican Revolution finally ended on 1 December 1920.